If you’re looking for super easy eco-friendly kitchen hacks that will save you money, you’re in the right place. Here are 5 tips for saving money and your health. The icing on top of the cake is that these hacks will also help the planet because they are eco-friendly alternatives to what people traditionally use. So, if you have any interest at all about pursuing a more zero waste kitchen to get the most “bang for your buck”, consider the following zero-waste kitchen hacks. You, your bank account, and the planet will be healthier for your switches! Some people believe that the FDA and other health agencies would outlaw anything that isn’t good for their health. If it’s sold in stores, shouldn’t it be safe to eat? Spoiler alert: maybe on an individual level. But with the accumulation from multiple products, are the level still safe for you? Other people are aware of the chemicals in produce but don’t care. These people simply rub and rinse produce under the tap for 5 seconds to hopefully get rid of the wax and visible dirt. Spoiler alert: it doesn’t get rid of the chemicals and barely removes the wax. The ones that do care generally try to purchase a vegetable/fruit wash spray like this one. It will remove the waxy film and chemicals present on the outside of the produce. Simple to use and relatively effective. The problem is that if you’re eating a heavy produce-based diet, the cost of this spray will add up. And you’ll be disposing or downcycling many plastic bottles per year. The last group of people have outsmarted the commercial produce wash spray people and have found an effective, cheaper, and less-wasteful alternative. This eco-friendly kitchen hack is to create your own produce cleaning solution of approximately one teaspoon of baking soda to two cups of water. With this hack, you can create a cleansing spa experience for your fruits and veggies for pennies. Ideally, you should soak your produce in this bath for 15 minutes, but if you’re short on time, others have noted that two minutes will suffice. If you don’t have that, some minutes is better than no minutes. Super short on time? Simply sprinkle some baking soda on your produce and rub under water. Just make sure to rinse off all the baking soda before eating! I used to go through a roll of paper towels every two weeks. At every step in a recipe, I would wash my hands and dry them with a paper towel. Very wasteful… and expensive! I finally said enough is enough and bought this pack of 12 100% cotton tea towels. I stuff the clean ones all in one drawer in the kitchen. I use one at a time to wipe my clean hands or dry the dishes. If I make a mess, I’ll use the existing tea towel to clean up the mess, toss it in a dedicated waste bin to wash on laundry day, and grab a new one for drying my hands. The ones I bought suit my purpose perfectly! They double up as pot handle protectors when my stainless steel pot handles get too hot. I’ve used them to dry my lettuce after washing as I don’t like watery salad. I even use them as dinner napkins when I’m eating something particularly messy. Because there are plenty (12 in my pack), I can easily toss into a dirty pile and get a new one to serve any kitchen need. My tea towels are just so multi-functional! An easy way to cut another plastic bottle out of your life is to make your own cleaning solution for the kitchen. Get yourself a glass spray bottle and mix away! Mix distilled white vinegar with water in a 1:1 ratio. The vinegar smell goes away once the solution dries up, but if it’s too much for you during the cleaning process, you can also mask it with essential oils. Perhaps this one! If you have naughty pets that jump on your kitchen surfaces, make sure to choose a pet-friendly essential oil for cleaning. Do you recall the plastic waste bin I mentioned in Hack #2? The bin I use to collect used tea towels? I bought that waste bin locally from Facebook Marketplace for $2. I bought a yoga mat, two plastic waste bins, and a set of 5-lb weights from the same lady. All of the items were nearly new, and I paid a total of $12. Guess what there is plenty of on the Facebook Marketplace. Kitchen stuff – because every single person uses kitchen stuff! But when you’re moving across the country, the shipping costs of something like ceramic dishware, due to its weight, far exceeds the value of the product, so people get rid of it. The size of a colander, due to its size, far exceeds the space allocable for it, so people get rid of it. And so forth. You can find things at firesale prices, especially from college students at the end of a semester. Check out your own Facebook Marketplace. There are some great deals out there, and it’s always better for the environment to buy second-hand! My absolute favorite item in my kitchen is a Mason jar. I love the retro look of them, and I love their multi-purpose capabilities. As you may have noticed from Hack #2 about tea towels, I invest in things that can serve way more than one function. 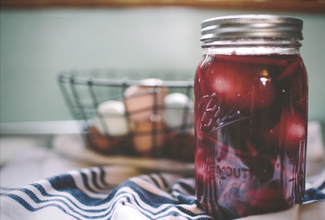 Mason jars are typically used for canning and preserving foods. I have never used my Mason jars for that purpose but am still a raving fan. You can probably get a set of 12 pint-sized Mason jars for $12 at your local supermarket or department store. I got mine delivered via Instacart from my local Wegmans. You can also check the price on Amazon here. I recommend the pint size with a wide-mouth. These Mason jars primarily serve as my drinking glasses. With 12 in a set, I have no shortage for each guest even for dinner parties. They tolerate both hot and cold so I can use one to brew my morning tea and use another one to freeze soups. When I have leftovers but I’ve used up all my glass containers, I can use my Mason jars to store extra food. I’ve used them to make kimchi. I’ve filled them with a homemade vanilla coconut trail mix to give as a simple and thoughtful last-minute gift. So many options! Do any of these eco-friendly kitchen hacks sound useful to you? If you’re hesitant about trying these kitchen hacks all at once, I would recommend that you start with the tea towels. Growing up, I never liked to use my tea towels because we would only switch them once a week. I felt they were dirty and did not ever want to touch one in my life again. Good thing I gave it a second try though because now I can’t imagine not using them going forward. The key is to have a lot, so you have no qualms about tossing an old one to replace with a new one. On laundry day, dump your whole bin into the load and refresh your clean towel supply. Hope it works out – let me know your thoughts and if you have any other must-know kitchen hacks that I should try out! I love that you’re creating a “cleansing spa treatment for your fruits and vegetables,” great imagery! Also, great idea. haha yes, isn’t it exactly like a spa treatment? !